This is one of the few times I’ve emerged from my cocoon of past papers, mymaths, coloured pens and calculations in 4 weeks. My mocks exams are over, but that’s just the beginning. Real exams start in two weeks so I’ll probably be scarce until the end of June. Right now I’m faced with a feedly of so many unread items that it has given up using numbers and just shows a dot instead. Plus a glaring 3-digit Mailbox App notification and two baking books to experiment with. The good news is, there’s so much fresh produce around now, all my favourites are coming into season. No. 1: asparagus. Followed by peas (which I will eat MOUNTAINS of fresh from the pod) and broad beans. 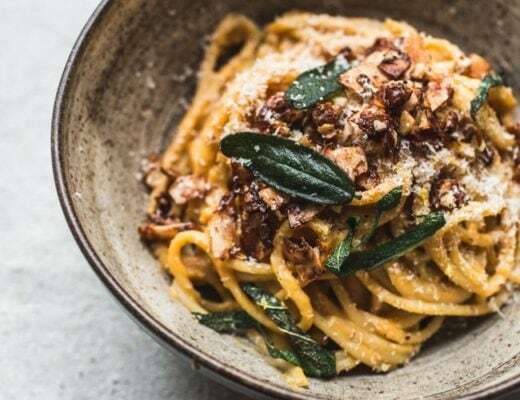 What better way is there to celebrate all of this delicious stuff than combining it into a simple, quick pasta dish. 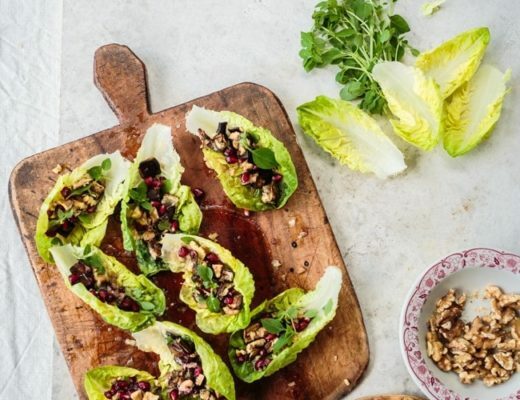 It’s perfect for an easy week night meal and there’s not to much messing around with the ingredients so you really let the freshness of them greens take center-stage. You may have noticed that there’s basil and lemon in there too – not an uncommon pairing on here. I just find it to be such a light, perfect way to lift the flavours without having to get pesto involved. Don’t get me wrong, I love pesto 100%, but it can monopolize the other ingredients in a dish and make it Basil-Olive Oil Central. Whereas I wanted it to be more like a basil-olive oil post-it note, if that makes sense (probably not..). I also got to use this ADORABLE casarecce pasta! It’s so twirly and the perfect shape for the asparagus and sugar snaps. Of course something like penne or fusilli would work just as well but uhhh would it look as cute? – nuh uh. I’m also suggesting that if there are some carnivore-centric people around, an addition of some crumbled smoky bacon, pancetta or grilled chicken would not go amiss here. Besides the produce, it’s also the perfect time for some niiiice, cold cocktails!! HEYO. I had my first Long Island Iced Tea last week (which I found surprisingly tasty – I was a bit sceptical of the mixture of 5 different types of alcohol with coke and lime, but it does work!) and a super refreshing Mango Mojito yesterday at The Fable Bar whilst having brunch with Rachel. (p.s. the waffles there are to die for. I think they’re like liege-style waffles….and now you can bet that I’m obsessing about making them at home). Sooo I’m thinking next week we can booze it up around here – yeah? Whatever I’m already crushing that ice so you’d better prepare yoselves. In a large pot of well-salted, boiling water cook the pasta until al-dente (according to the directions on the packet). Drain the pasta, return it to the pot and toss with the olive oil, chopped basil, lemon zest and half of the lemon juice. Season with salt, to taste. Discard the remaining lemon juice and set the pasta aside. 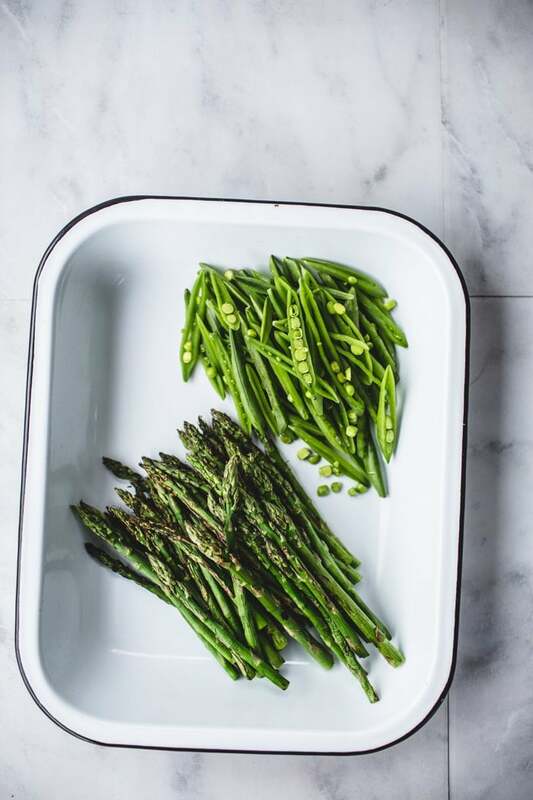 In a griddle pan, cook the asparagus spears over a high heat for a few minutes - turning them over using kitchen tongs - until tender and slightly charred. Thinly slice the sugar snap peas length-ways into strips. 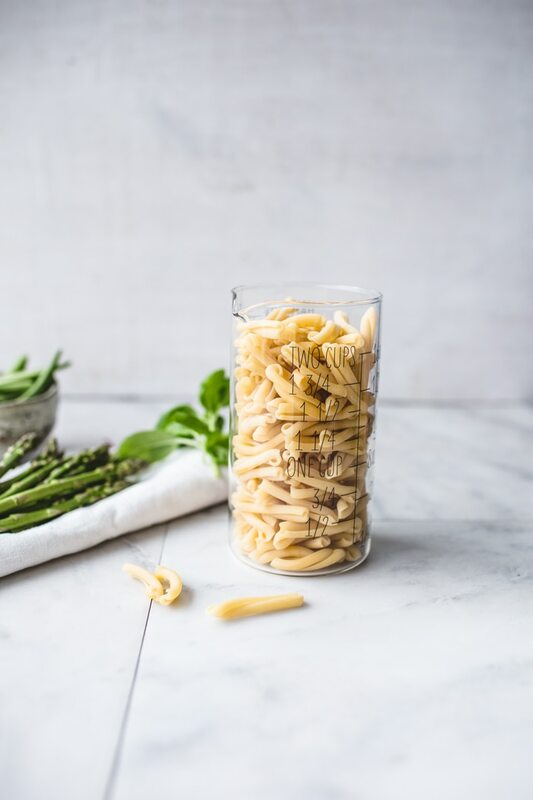 In a large serving bowl, arrange the pasta, grilled asparagus and sliced sugar snap peas. Dot with spoonfuls of the ricotta cheese. Serve warm or at room temperature. This looks to die for, Izy! 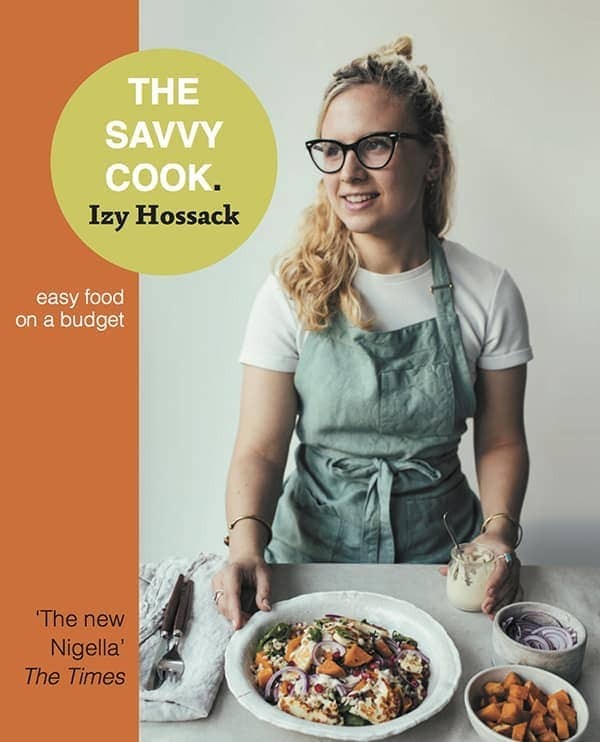 I just love simple, healthy, honest-to-goodness recipes, that I can whip up and take to uni with me! Can’t wait to try this! I love this type of pasta dishes, Izy. So refreshing and simple and quick to make. 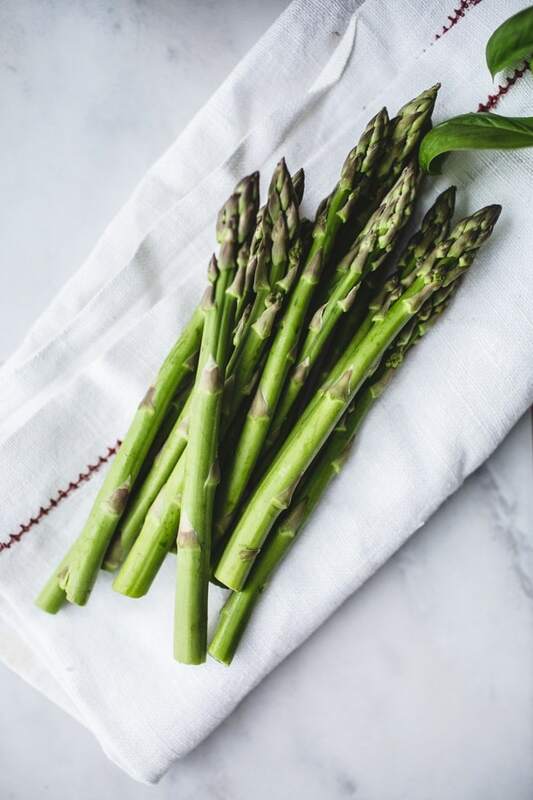 I have been devouring asparagus too this past month… I love spring vegetables! I am totally crushing on this recipe! Too bad summer is over in Aussie but I look forward to see how the warmmer weather inspires you. 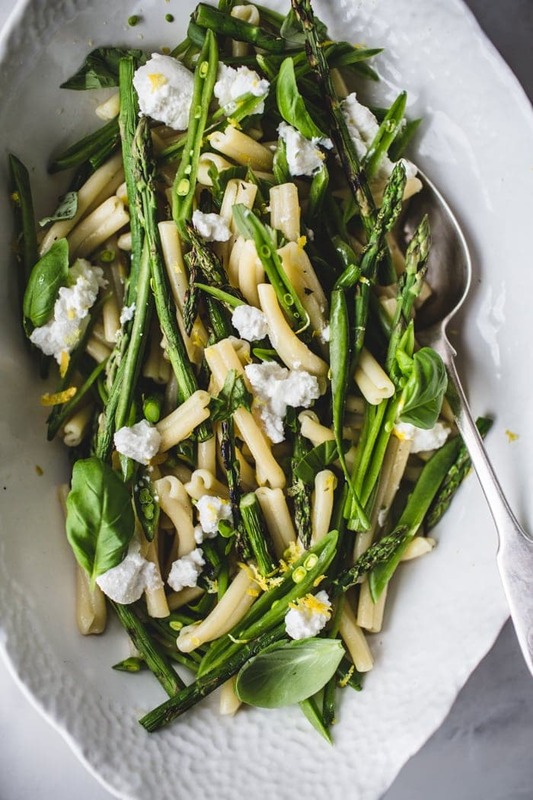 I love anything with asparagus and this recipe is looking really delicious! Good luck studying for your exams! I love the simplicity of this as it is so easy to go overboard sometimes with ingredients. I bet this would taste amazing with homemade ricotta. Gorgeous! Good luck on all your exams! A good book club meal I think! This looks fabulous. Though, I’m not sure it is really accurate to call our trip to The Fable as *brunch*! Gorgeous. I love it when the asparagus is in season. I eat it on everything. Good luck with your exams, afterwards you’ll have to celebrate with cake and cocktails. Dear god, this is gorgeous. Your photos are the best. Seriously, the best. And I love you plate. on a warm summer night. So perfect, thanks! Ooo this is beautiful! So bright and springy! And I do loooove that pasta. The right pasta shape certainly does make the dish taste different. It’s a real thing. 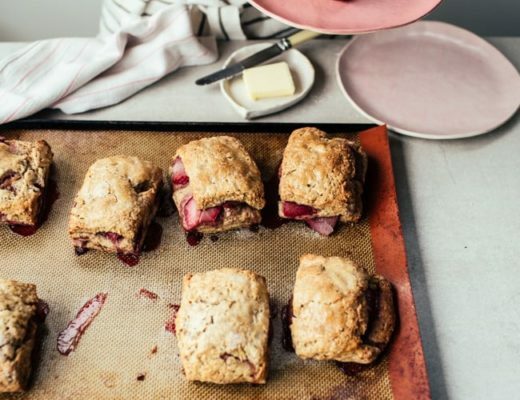 I bet these flavors are perfect with some crumbly bacon… Yum! Loving the fresh sound of this! And since it’s FINALLY getting warm in london I think this means many more picnics – so this seems perfect! I love asparagus, so I definitely don’t need a reason to gobble this up. 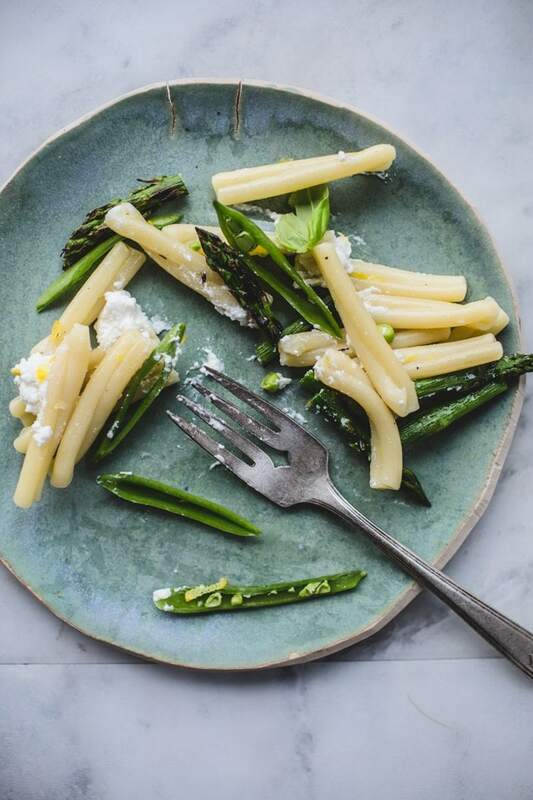 Love a simple dish that allows the already perfect flavor fresh asparagus to shine through. I have some ewe cream cheese (randomly included by our CSA last week) and some purple heirloom asparagus that I might try using with this recipe. Looking forward to your cocktail post. Oh my goodness. Just stumbled across your blog and I LOVE it! Your photos are absolutely stunning. This looks so fresh and delicious. I’m sure it would make a perfect weeknight meal! Anything with asparagus and snap peas draws me in. 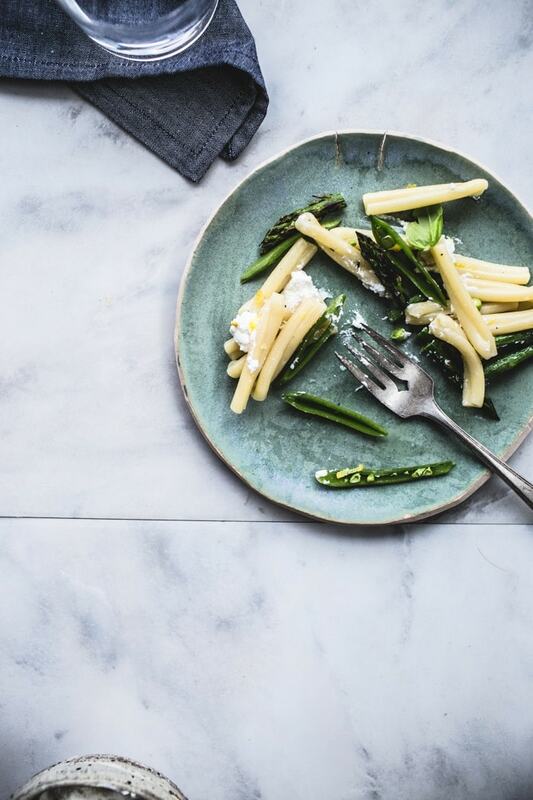 I actually just made The Smitten Kitchen’s ricotta sugar snap pea pasta and it was delicious! This looks amazing too. I blogged about a dish so similar to this a couple of days ago and it was absolutely delicious. So fresh-tasting and perfect for spring. Love the way you let the veggies take centre stage in your dish, and of course beautiful photos as ever. I love your little beaker measuring cups. They are super cute! Where did you get them? What a beautiful dish! Good luck on school! Great recipe! I must to try it, thanks! This looks absolutely incredible – the colors! the cute pastas! the cheese! And I just love your photo styling. Two thumbs up for everything in this post!